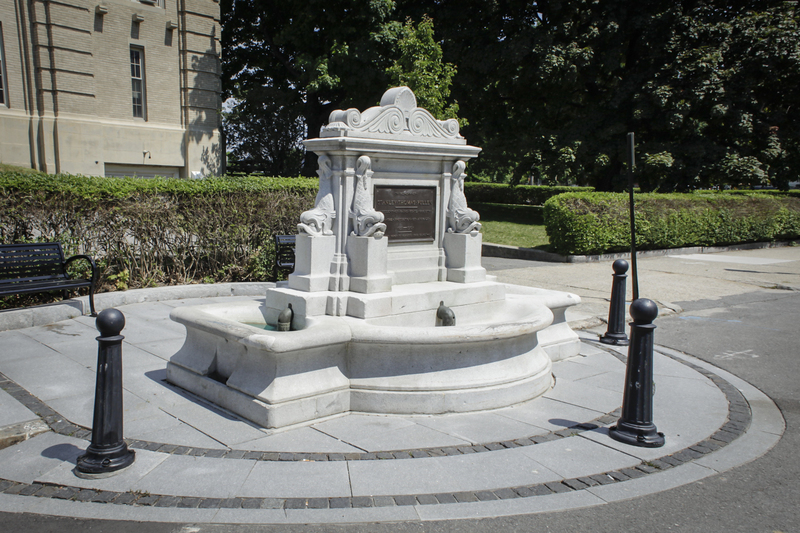 The Stanley Pullen Fountain was installed in 1910 as a horse trough and fountain on what was then the busy thoroughfare of Federal Street. 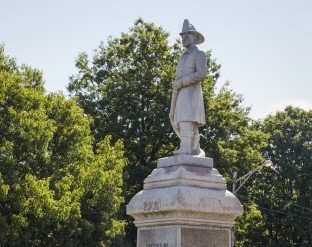 The granite fountain, designed by George Burnham of Portland, and executed by the New Hampshire Granite Company, was named in honor of local lawyer, politician, and onetime editor of the Portland Daily Press, Stanley Thomas Pullen. The fountain has served as a horse-watering trough for more than a century and remains in use today in the warmer months, when horse drawn tour carriages stop at the fountain to water their horses. 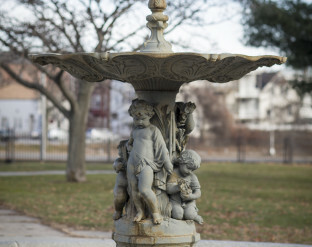 The classically designed granite fountain is ornamented with six dolphins, and during its heyday local children referred it to as “the bubble.” The Jay, Maine granite used was also used in City Hall, Evergreen Chapel, and the Deering Oaks columns. Stanley Pullen was one of the founders of The Portland Society for the Prevention of Cruelty to Animals in 1872, and was instrumental in the formation of the Maine Society for the Protection of Animals. He is widely considered one of the State’s first animal rights pioneers. 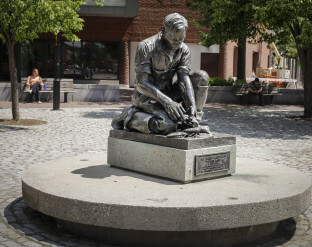 In 2010 the Portland Public Art Committee led a restoration effort for the fountain, including enhanced seating, placing protective bollards, refurbishment of the granite base, and repairs to the plumbing so that all the water elements now work. Tony Muench, landscape architect and Committee member, along with conservator, Jonathan Taggart, led the restoration work. George Burnham, Architect and designer. New Hampshire Granite Company, Contractor.